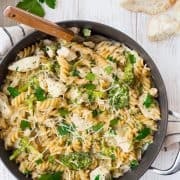 An Easy Chicken Alfredo Recipe with Broccoli that’s made in ONE PAN and has far less calories than a traditional Alfredo? Does it seem too good to be true? It’s not! 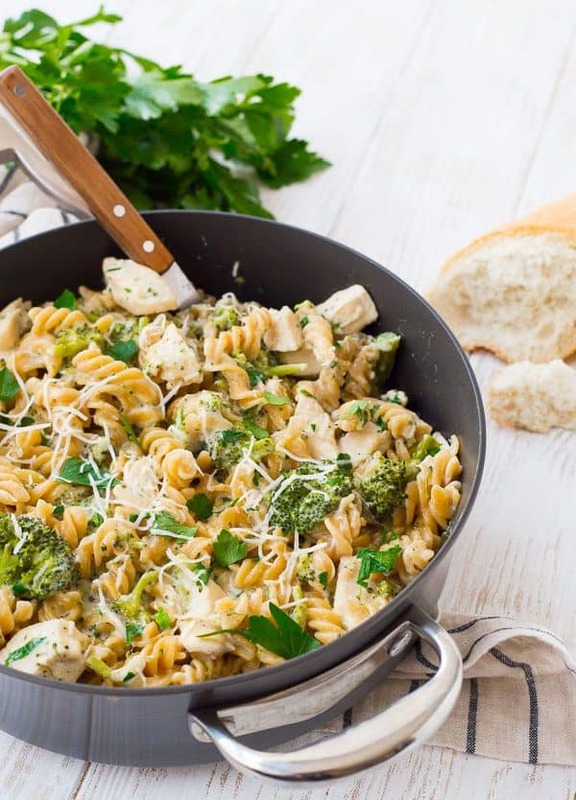 This recipe is the perfect thing to satisfy that Alfredo craving without leaving you feeling sluggish and overly full. Make it tonight! People always think that because I’m a food blogger, I must cook gourmet meals every night. Spoiler alert, I don’t. When Ben is gone at work, which is frequently, the kids eat cereal and I eat popcorn. Everyone is happy and I don’t have to cook a big dinner. When Ben is home, I do cook, but I keep it simple. That’s probably not a huge surprise judging from the easy recipes you’ll find here on Rachel Cooks. When I moved back “home” (home in quotations because home is wherever I’m with my family) to the western part of Michigan with my family after living on the other side of the state for 8 years, I was on a mission to form friendships, and do it asap. I had (have) a few friends from high school and of course my family, but I needed more. I made it my mission to make friends with other moms at the school my kids attend. I did this by starting a “Cooking Club,” which is basically a glorified excuse to have a mom’s night out with friends. Sometimes we cook, sometimes we don’t. We take turns hosting and the host picks a theme and cooks a main dish. Everyone else brings sides, salads, appetizers, and desserts. We usually all show up with a bottle of wine, too. We’ve done a holiday appetizers and desserts night, we’ve done a spring-themed meal, a healthy cooking club in January, and a couples Cooking Club for Christmas where we had our husbands join us. We’ve done an Instant Pot night where we made the food together – I don’t think I’ve ever laughed so hard. We’ve also done a few “Cooking” Clubs at restaurants on days when no one really felt like cooking. We’ve met to prep some meals for a family in need. If it’s an especially busy month and the evenings are filled, sometimes we’ll meet for breakfast. It’s been such a highlight of moving back here and I’m so thrilled to have developed wonderful and treasured friendships. There are 12 of us so we’re always able to get at least 5 or 6 together with a little planning. Also, ummm….aren’t they all gorgeous? This month, I realllllly didn’t feel like cooking (it happens!). We ended up doing a giant cheese and charcuterie platter (you probably caught that if you follow along with my Instagram stories). It was the perfect relaxed night that I think we all needed. I know I did. There might have also been a frozen pizza involved…this is how I know I’ve found my people. My people are real, and not afraid to admit it. My people love one pan meals, but they’re also not afraid to pop that frozen pizza in the oven. My people love a good fancy restaurant-prepared entree, but they also love some delicious store-bought spinach dip. You guys are all my people. They’re transitioning their Spartan products to the new Our Family label and I love that they consider their customers family. In addition, SpartanNash stores feel the same way I do about fresh produce! Not only do they support local farmers, but they also guarantee that if you aren’t completely satisfied with your purchase, they will exchange it, and refund it! Tip: You can find SpartanNash products at stores including D&W, Family Fare, Forest Hill Foods, VG’s, and more. Look for these brands: Our Family, Full Circle Market, Open Acres, Good to Go, and Valu Time (click here for full list). Let’s talk about this Easy Chicken Alfredo! We’ve already established that I live for easy recipes, but if you need further proof, make sure to check out (and try!) my Healthy Homemade Hamburger Helper and my Taco Pasta, or my whole list of one pan meals! If you’re allergic to doing dishes like I am, I’m here to save the day. 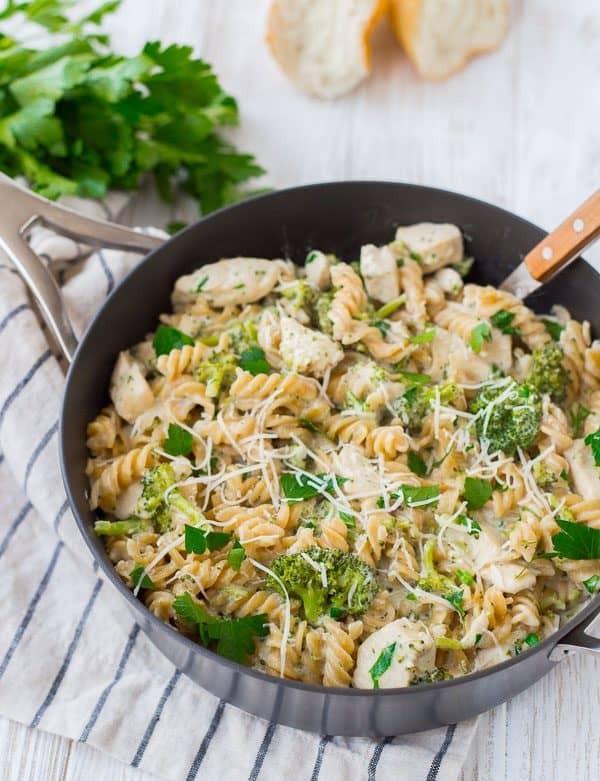 I made this one pan Easy Chicken Alfredo a bit healthier by using Full Circle Organic Whole Wheat Rotini, broccoli, and a mix of 2% milk and cream instead of all cream. Now, I realize that whole wheat rotini isn’t the traditional pasta used with Alfredo sauce. If you want to use fettuccine, GO FOR IT. I won’t stop ya. You’ll need to adjust cooking time based on what the back of your package says. I’ll let you in on a secret, friends. I often opt for shorter pasta shapes like rotini, penne, ziti, etc. over spaghetti, fettuccine, and angel hair. There’s a reason for this, and it’s one I feel comfortable sharing with you guys, because you are my people. It’s because they’re easier to eat, plain and simple. Less sauce on my face, less twirling with a fork, more enjoying the food. But if you can’t get past eating Alfredo with any other pasta shape than fettuccine, I get that too. Do your thing. 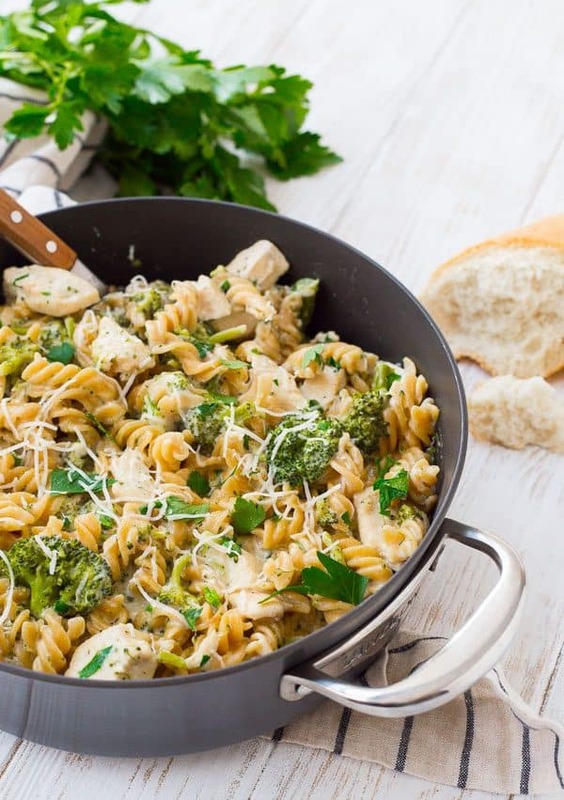 The important thing here is that you get a fabulous, delicious, well-rounded meal in one pan in 30 minutes, no matter what pasta shape you use. Life is good. Watch this short video to learn how to make this easy chicken alfredo recipe! 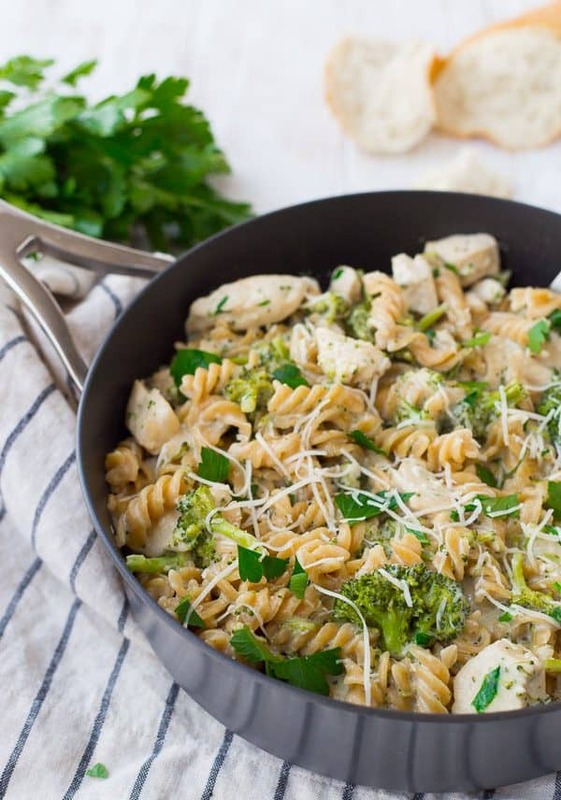 Easy Chicken Alfredo with Broccoli - ONE PAN + Healthy! 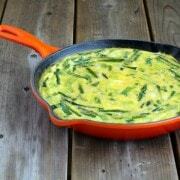 In a large, deep skillet (that has a cover available), heat butter and olive oil over medium-high heat. Add chicken and sprinkle with salt and pepper. Brown chicken until golden-brown on the outside and almost cooked through. Add broccoli, Full Circle Organic Whole Wheat Rotini, broth, and milk. Stir to combine. Cover, turn heat to high and bring to a boil. Reduce heat to medium-low and cook covered for 8 minutes, stirring every couple of minutes (to cook pasta evenly), or until pasta is al dente. Uncover and reduce heat to low. Add warmed cream, Parmesan, and parsley. 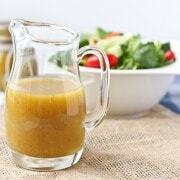 Cook until Parmesan is melted and sauce has thickened slightly. Verdict: I love this comforting, easy to make pasta. Husband’s take: No complaints from the peanut gallery about this easy chicken Alfredo. Changes I would make: None are necessary but if you want to have fun and add in some spinach, red bell peppers, or any of your favorite vegetables, they would be great additions. Difficulty: Easy! One pan, no-fuss. This recipe is awful. The sauce never thickened and definitely lacks flavor. My sauce thickens nicely. Did you follow the recipe exactly? 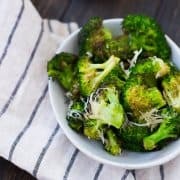 Stumbled upon this recipe and really interested to make it. But this is my first time really cooking (want to treat my girlfriend to a little something (i know this van feed six but just to have left overs would be cool)Can i get some pointers and tips on this recipe. (Like how do i warm the cream and like what to be on top of… i wanna try and get it to the best of my abilities for cooking for the first time) thank you so much! Make sure you read the full recipe through a couple times, measure stuff out in advance and put it in bowls, and warm the cream in a saucepan over low heat. You got this! This looks seriously delicious. I love that you joined a cooking club. I think having gal pals to hang out with is so important. This is calling my name!! This is such a wonderful combo and looks delicious too! So…I’m totally stealing your cooking club idea, I love that!! You know, when my husband is gone, we eat popcorn for dinner too, but this is certainly easy enough to make and looks so good. I shouldn’t settle for popcorn anymore! 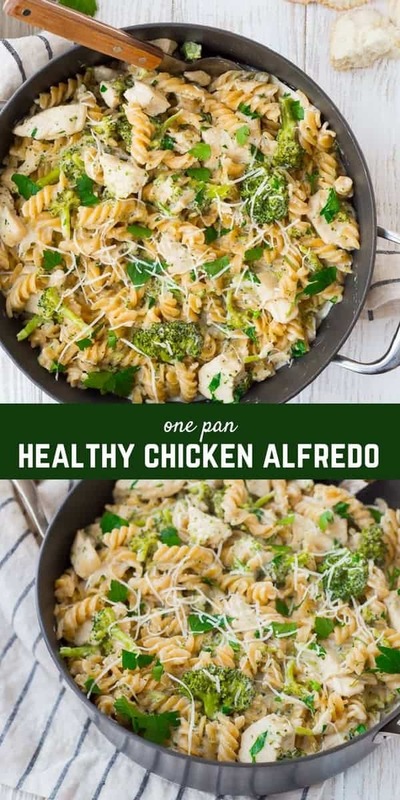 I’m a sucker for alfredo, so I can’t wait to try this! This is my kind of meal! Quick and easy. With you all the way :-) Thank you ! Nice easy meal! And I love that you made it healthy! 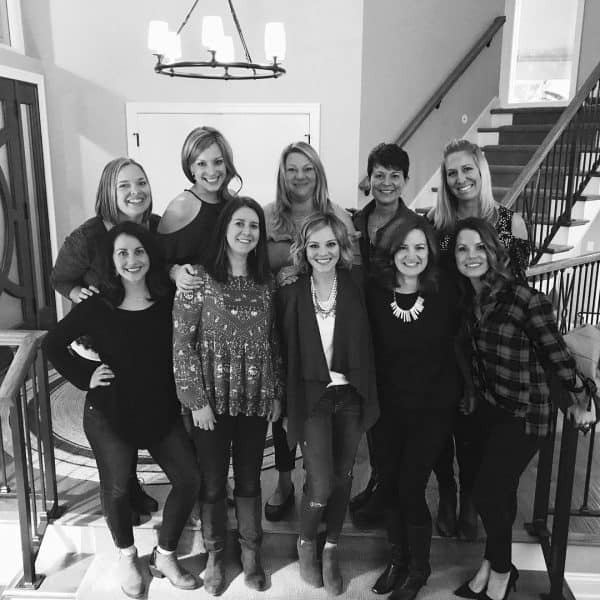 Love the idea of a “cooking club.” It’s hard to make time with friends without the kiddos. So true, but it’s so important! Thanks Megan! One pot easy meals are so smart! 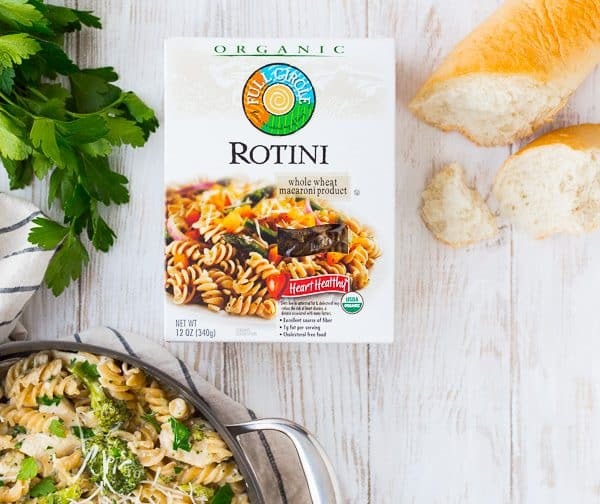 Love that you’ve made this one healthy with that yummy whole wheat rotini! That’s such perfect comfort food, yum! I love an easy one-pot meal! Yes, please! I would love the entire skillet!